Private bungalows with ensuite bathrooms, a fine sandy beach and rich house reef on Pulau Kri’s quieter southern shore. Turtle encounters are guaranteed! A single room bungalow with ensuite bathroom and toilet. Sleeps max. 2 persons / room. Turtle Beach Bungalows offers three private bungalows with ensuite bathrooms in quiet Warahnus Cove on the south side of Pulau Kri. Set on land, in the shade of beachside trees, each bungalow sleeps two on mattresses on the floor. Extra mattresses can be provided if required. Bedding supplied includes sheets, pillows, bolsters and mosquito nets. Ensuite bathrooms have tiled floors, with bucket bathing and western style toilets. Towel rails, clothes hooks and a mirror are supplied. The bungalows are supplied with room light switches and power outlets and a small indoor table. Bungalow verandahs have excellent beach and sea views and are equipped with a table and chairs. Meals are served in a beachside dining room where free drinking water and tea and coffee making supplies are always freely available to guests. Electricity is provided by generator and is available from sunset to about midnight. Turtle Beach Bungalows receives a good 4G phone signal that supports a data connection. English is spoken at Turtle Beach Bungalows. Transport between Turtle Beach Bungalows and Waisai costs IDR 800,000 each way. The trip is made in a longboat capable of carrying up to 6 people, and the cost is shared by passengers. Read more about Raja Ampat boat transport prices here. Excellent snorkelling is available straight off the beach, and Turtle Beach Bungalows can organise any snorkelling and sightseeing trips you want to do. Warahnus Cove is the quietest location on Kri. It’s a great base from which to take advantage of Kri’s amenities, while still retaining a private island feeling. See our Kri Island page for more information about Kri and its attractions. If the homestay features above do not show that English is spoken, you'll need to use Bahasa Indonesia. In either case, keep it simple! Using the booking form is best for homestays that have one. Please don't use both - confusion will be the only result!. SMS text message is the most reliable way to make contact. Many contacts have no permanent access to phone or email - don't expect an instant response to your enquiry. Please read our How to Book Raja Ampat Accommodation page so you know what to expect. Posting feedback about your homestay experience will help your hosts and fellow travellers. All feedback is passed on and contributes to the success of the local ecotourism economy which underpins international conservation efforts in Raja Ampat. Please leave a comment or review below and take the time to respond to this online Raja Ampat ecotourism survey. Your input is valued and appreciated! In December 2018/January 2019 we went to West-Papua for the first time and we really fell in love with this part of Indonesia. Staying in Turtle homestay on Kri was a highlight of our trip. As the homestay is family run, all family members make their guest’s stay very relaxed and try to fulfill all the wishes and needs of their guests. During the whole stay we always felt very welcome, almost being a part of the family and we enjoyed our time there a lot. No matter if you want to enjoy the treasures of the ocean, if you want to explore the island overland, make a daytrip to the neighbouring islands or just hang around in the hammock in front of your bungalow – there is enough to do for everybody. Last but not least also food was prepared with love and always varied and tasted delicious. Unfortunately time did run too fast and leaving this cozy plaze was really sad. So one more reason to come back…and we definitively will do! Nelly and family, “injo” for being our hosts and please, don`t change, everything was perfect! Turtle Beach is a good quiet place to stay for some days. We enjoyed the food, but brought also our own Porridge to extent the breakfast a bit. It‘s a pity, that the neighbors Fridas bild so many (3+ 5 ) overwater bungalows, which takes the good view to the nive halfmoon beach. We and also the guests in the other bungalows had all rats by night, whats not so comfortable and noisy. In all homestays we stood in Raja Ampat we‘ve got free drinking water. Great! On the balcony we had two grood chairs and a hamerock, but the bench in the outdoor restaurant isnot very comfortable to stay a while and be together with the other guests. Thanks a lot to the family! We stayed here from 2 till 12 March 2019. This review is divided in the following sections: hospitality, hygiene, location, accomodation, food and price. Every section is rated with a number between 1 and 5. Where 5 is best. When we arrived at Turtle Beach they helped us carrying our bags to the bungalow and a nice cup of tea was made for us. A good start of our holiday! Whenever we had questions or we needed something they were there for us. For example we wanted to make a trip to Pianemo and Johny helped us figuring out what was the best to do. Why a 3 and not 5? In our bungalow there were two nests of rats. This was actually the only downside to our stay here. One big rat used our bungalow as his toilet. There was a terrible smell of it. Which let to us sleeping with our heads on the other side of the bed. Rats are common on Kri, they are in every accomodation. The other guests that stayed at Turtle Beach didnt have as much problems with the rats as we did. So I think it was just our bungalow. We told Johny that the smell was bad and they instantly cleaned it, which made it bearable. The rest of property is well maintained and cleaned every day. So it looked quite tidy. Turtle Beach lies in Kri Island. Turtle beach is on the not so crowded side of Kri, which I definitely prefer. It was quiet and you had the feeling you were alone at the island. Another plus is the housereef just at your doorstep. The housereef is amazing for snorkeling and diving. We snorkeled every day we didnt dive and we saw a lot of beautiful corals, turtles and sharks! Last plus is that the island is quiet central for making trips for example to Pianemo or Arborek. Saves you money! The bed was really good, although every night we both rolled to the middle of the bed haha. There was a nice mirror, a hammock, a chair to read in and a western toilet. On Kri it is not common that you have a private bathroom so this is a big plus of these bungalows! At Turtle beach there is breakfast at 7 am. This was mostly fried bananas or cake and tea. For me this was not enough. But later there was bread with jam and peanutbutter, which made it an excellent breakfast! The lunch was between 12 and 14 pm. The portions of lunch were diverse, very good prepared and often the best meal of the day. We had rice, vegetables and fish or chicken and some fruit on the side. Diner was perfect, big fried fish enough for everybody. Everybody pays 400000 a person a night, thats roundabout 25 euros including all your meals. I think the price is a steal for what you get. For this price you get to live in paradise with a beautiful view over the bay, excellent and enough food, perfect diving and snorkeling location and extremely friendly staff! Cheers to Nelly and Johny and we hope to see you again! We had a very nice & friendly welcome at Turtle Beach ( we stayed there Jan. 14 – 19. 2019), the Bungalows are superb & clean, Food was good, – and delicious after 3 days , when Nelly arrieved ! (:, we had Chicken & cold beer – great !! the house-reef is fantastic and you can walk a pretty long beach – thank you Nelly & Family, we wish to be there now !! !, and special greetings to Jhon, you are a superb boatman & guide, we had a nice time & fun with you, especially the day when we went to the sandbank at Cape Kri – best wishes to all of you, we try to come back some day ! Thank you so much for everyting and see you next time. Lovely family, very nice food and lovely huts. Also had cold bintang which is a big bonus in RA! Thank you for staying whit us. Restaurant: very nice open Air Restaurant – very friendly, warm and welcoming atmosphere, all the time there is coffee, tea and cookies. It‘s really nice to hang out there and have a chat with the family or the other guests. Food: A-PLUS… considering the feedback from people who went to other places on Kri I would say, Turtle Beach Bungalows provides the best and most delicious food on Kri. It‘s rich and varying, tasteful and just yummy. There was enough for everyone – just perfect. What makes the place special… the family! they are so kind and helpful, organize transports and tours or giving you suggestions what to do. We just can say, thank you for this wonderful time. And thank you so much for everytings. Best place to be on Kri Island ! Comfortable bungalows with a real bed, en-suite-bathrooms, beautiful setting among trees on the beach. The best food we had in Raja Ampat during our 3 visits there: delicious, great variety, snacks in the afternoon. The hosts are the nicest & honest people, always a big smile, great hospitality and always ready for a chat. We stayed there one week in December, would have loved to stay longer. 5 stars are not enough. We hope to come back in March. WE MISS YOU! Terimah kasih banyak. Sampai jumpa lagih! I hope you come back here.. This place is special and the best around the island. It is runned by a very friendly papua family.. I stayed with my girlfriend one week and we really loved it. The first night we stayed somewhere else, we die not like IT there and we had a look around. At the end of our search we found this place. the family welcomed is with a big smile. The rooms are located on the beach and have a private bathroom andere toilet. This is not commen on the island. The food is perfect and we did many tours in the area. We are coming back for Shure..
Terima kasih banyak keluargaku Mr. Francis yang sangat baik kepada kami. Thank you for staying in turtle homestay. Thank you for everyting. After you leave we sad.. but i hope next time we meet you again… see you..
Really nice homestay! People managing, food, location… i mean; my first idea was expend there just 2 days and finally i have been there the whole week! Nely is amazing cooking! Simson really good boat driving, always available to drive us to all the good spots! Its being amazing days there! I will come back for sure! Terima kasih my friend carlos. Is there any Dive center nearby? Thanks for keeping this up! Your website is soooo useful! Neighbour Lumba Lumba has a dive center. You can quickly find all the others on Kri by simultaneously applying the accommodation page “Kri” location filter and “On site dive center” Activities filter. Great place to be ! Spacious comfortable bungalows including en-suite-bathrooms; very delicious and varied food, lovely staff (Melly & family are very pleasant people – thank you for all !) and the fantastic house reef at Waranhus-jetty right beneath will make this homestay a very special place for your stay on Kri-Island. Make yourself a pleasure ! Thank you for staying with us and thank you for all. On the website, price transfer from Wasai is written 600 000. I have asked confirmation price before taking the boat. They answer me I have to discuss this with the owner (which was not on the boat). Then after arriving at the homestay, they say 600 000 is old price, you have to pay now 700 000. Oil price is higher and bulshit. As they are member of the association, this is not fair. Do I have to accept new price? No, you don’t! Turtle Beach supplied their prices one month ago. It is their responsibility to keep their information updated, it is only a phone call to do that, and all homestays must only charge the prices they have advised on the website. Unfortunatly the rest of our stay is compromis. We want to stay until Monday. For sure we have not been clear about our date departure. But they have accepted a new booking and tell us around 10 o’clock this morning that we can’t stay and must leave tomorrow morning. It’s very short time for us to organize new booking. We lost all our day try to find available place. But almost 4 pm and didn’t find solution. Lol. Sounds like you didn’t book through the website. (Can’t find any booking from your email address anyway.) Booking via the website is always the easiest and most reliable way, and gets you our support in the event of problems. Good luck! Yes we book directly at your counter at Wasai. But that’s OK, we understand that the management of extention when there is only 3 bungalows is not easy. We will move tomorow. 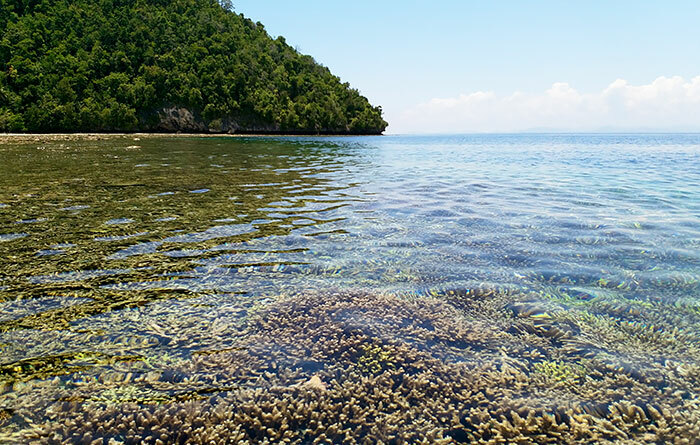 We are already in Indonesia since 22th october and are used to make late or no booking… It was easy because It’s low season everywhere but not in Raja Ampat which is crowdy. Thank you for staying with us and for all. Warahnus, Firdas and Lumba Lumba share the same beach. Entering the water at low tide is easy from Warahnus’ jetty. We stayed here for 4 nights. Nelly and her whole family were very caring and welcoming. The food was awesome, always abundant and varied from day to day. With all the nice little details, the bungalows are more like in a hotel than in a homestay. It is probably one of the most luxury homestays on the island. We really enjoyed our stay there. 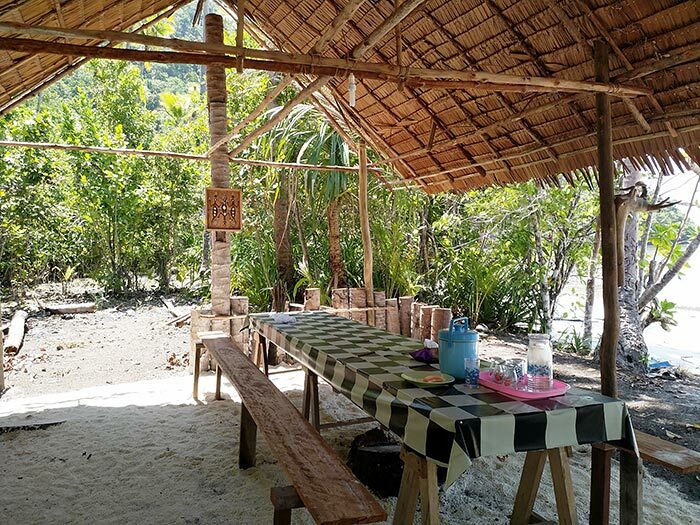 Particularly compared to the more busy northern cost of Kri, Turtle Beach Homestay is perfect for everyone who wants to relax in a beautiful place. Of the four homestays we have seen on Raja Ampat, it was definitely the best. We highly recommend it to anyone going to Kri. thank you for all and i hope you come to our place again at another time. 1. From the first moment we felt very welcome and home. We had an amazing time during our five nights stay in turtle beach bungalows. 2. This new built bungalows have a very good bed with a new -and not too soft- matrace. Due to the open space under the roof it was never too hot in the night. The bathroom is inside the bungalow. There is a stylish furniture for the clothes and towels. On the terasse is a hamock and in front a chillout bench on the beach. 3. The food was the most various we have had in a homestay in indonesia for a long time. We got everything from fish sate with peanut sauce to fresh barbecue fish with jolojolo, fish or chicken curry, barbecue chicken and soups. Food was eather served with salad or vegetables (potatos; wild spinach; carrot; cabbage). Every meal ended with a plate of fruits (every day another) and twice fresh baked sweets by Nelly; sometimes a drink of young coconut. We were eating and feeling like in a food paradise. 4. We liked the quiet location on the long southern beach of kri. We got droped by the staff by boat at yenbuba jetty from where we snorkel a fantastic 1-2 hours until home. We could go anytime to shore if we feel tired as we were swiming basically along the beach. In the evening we took a short mountain walk of 30 minutes to enjoy the sunset from top of kri island. We wish Nelly and Simson and the staff members Elis and Labe all the best for their homestay turtle beach bungalows. thank you very much mona and georg we feel lonely after you leave. but thank you very much for everything we enjoyed together for 5 days. Samson and I will not forget all these moments. we will always miss you.